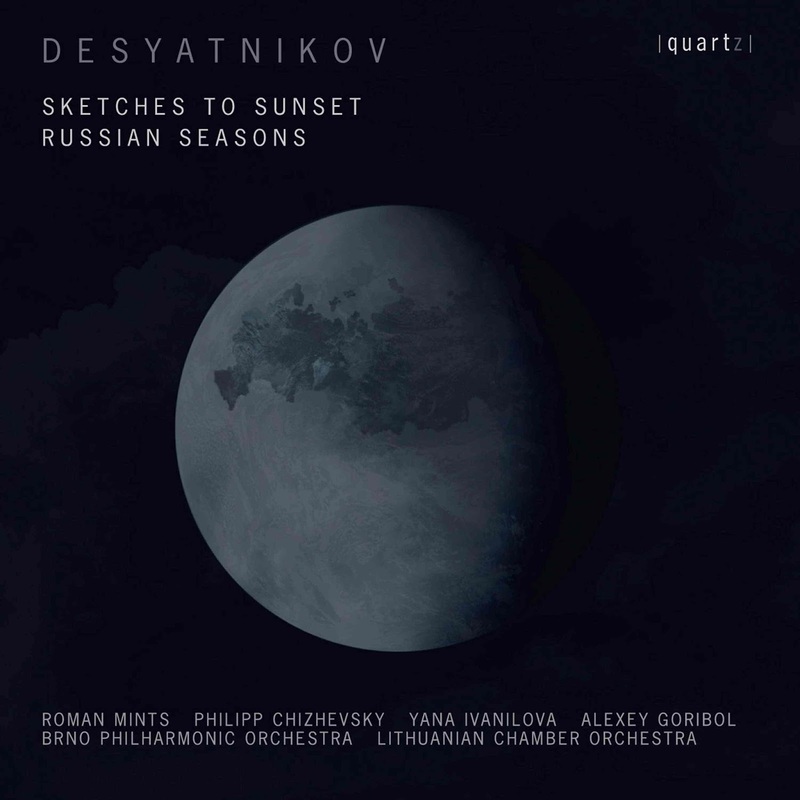 The music of Destyatnikov has imagination, warmth and modern tonal folk fire. At least that is what I feel when listening to the two-work CD Sketches to Sunset / Russian Seasons (Quartz 2122). "Russian Seasons" (2000) is divided into 12 vignettes for violin (Roman Mints), voice (Yana Ivanilova) and chamber orchestra (Lithuanian Chamber Orchestra under Philipp Chizhevsky). It was written for Gidon Kremer and Kremerata Baltica, who gave it the first performance. Lake District Russian folk themes form the basis of the music. There are some moments that have a genetic affinity with the neo-classic-folk period of Stravinsky, especially in its modular rhythmic liveliness and thematic organicism. But then you discover an overall originality that transcends influence yet remains very much Russian. It is a work that captivates and enchants in the most worthy ways. 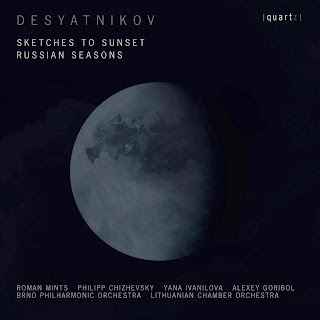 "Sketches to Sunset" (1992), in first recording for Mints, Alexey Goribal and the Brno Philharmonic Orchestra under Chizhevsky, kicks off with a rhapsodic mysterioso folk-laced theme for violin and orchestra. It is segued to a Russianesque quasi-Jewish sounding tango theme based on "Death in Venice." Onward it goes from there, touching down poignantly on various memorable moods and modes. The sunset has an almost sultry air to it in Destyanikov's hands, yet there is regret and a biblical underpinning ("Absolom's Death") that feels ultimately Russian-Jewish in fascinating ways. The music is based on the Desyanikov's score to the film "Sunset" which takes place in Odessa before the revolution. A primal sort of experience of the haze of time seems palpable in the thematic sequencing. One is left holding the air of the present as the spell the music casts comes to a close. The two works stand out as very characterful, strongly tonal and giving off with originally transformative pre-modern and post-modern elements. Any Russophile will respond well to this music I would think. Desyatnikov has an inimitably tabula rasa way, yet there is strong tradition paradoxically present, too. A definite joy to immerse oneself in!